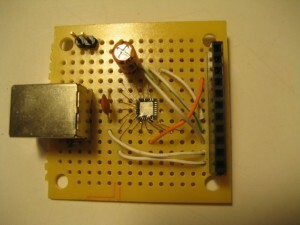 Standard Arduino boards use FTDI’s FT232RL to interface with computer’s USB port. Since FT232R is just a USB to UART converter, it is possible to build an Arduino compatible USB interface using other USB to UART chips. One such alternative is Silicon Labs‘ CP2102. I particularly like this USB to UART transceiver because very few extra components are required for it to work. As an added benefit, this chip is also cheaper than the ubiquitous FT232R. Of course, there are also a few trade offs. First of all, CP2102 does not provide a bit bang interface (the X3 pins on the Arduino board on the other hand can be used for bit bang operations, but the X3 pins are not soldered with header pins by default and thus for the average users no bit bang support should not be an issue). Secondly, CP2102 does not have the configurable general purpose I/O pins to drive the TX/RX LEDs. There are other minor differences as well (for instance the maximum transmission speed for FT232R is 3Mbps while CP2102 tops at 1Mbps. Both chips are more than adequate for the maximum 115,200 baud rate supported in Arduino environment), but they do not affect the performance in our application of interfacing with Arduino. if you compare the above circuit with the official Arduino Duemilanove board you will see that the interfacing portions (RXD, TXD and TDR) are virtually identical. Since CP2102 comes only in QFN-28 packaging, some people might find it slightly harder to deal with than TSSOP. Using the prototyping method I mentioned a few months back though, it is fairly straightforward to use the chip on a standard perf-board nevertheless. No special tools or stencils are needed. The following picture shows the USB to UART converter portion of the Arduino, which can be used to replace the FT232 break out board. I chose to break out the converter so that I could use it in other projects that require serial connections. If you are running Windows, you will need to install the royalty-free driver from Silicon Labs directly. Under Linux, CP210x shows up as a a ttyUSB device. You can use the Arduino IDE to program your ATmega328p’s just as you would with an official Arduino. Serial communication via the serial monitor works the same way as well. Like the official Arduino, the above circuit also automatically resets whenever you upload a program. 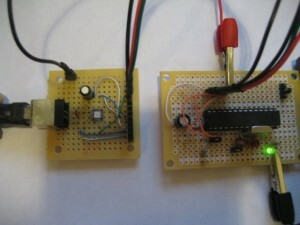 The following picture shows this Arduino compatible circuit in action. RX/TX pins (digital pin 0 and 1) should not be used for other purposes if you need to use the USB capability. This is similar to the situations with the official Arduino board. As far as Linux is concerned, I don’t believe there’s any issue. I did read about issues some people had while running under MacOS though. But if you are using Linux (or Windows), you should be all set. 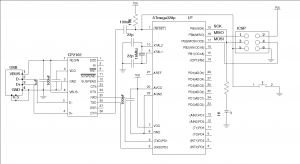 Which ATmega328p bootloader were you using with this CP2102 interface, and do you happen to have an Eagle schematic for the circuit above? I used the bootloader for Duemilanove. But I am pretty sure any bootloader should work. Sorry, I don’t have the schematic file…. I created the schematics for illustration purpose only and I did not design any board layout for this project. And what is the input voltage you are giving 5v or 3.3V? This is directly from the reference design and it works pretty well. Other more complex designs may offer more functions (e.g. 3.3v/5v) as this particular one is 5V only. Thank you, I will follow your circuit diagram. Hi, I tried soldering by the way you did. But I am getting a short circuit between the pins. how did you solder the way its shown in the picture. You can take a look at a tutorial I did a while ago (http://www.kerrywong.com/2011/09/25/hand-soldering-fine-pitch-lga-chip/), it’s not the easiest thing in the world but definitely doable. :) it worked. Now I have one more query. How to change the product description string in the EEPROM? Assuming that you want to use Arduino on your ATmega328p, I’d recommend you reading http://arduino.cc/en/Tutorial/ArduinoISP to get an idea of how to bootloading your Arduino. If you are using ICSP method (e.g. the method I used here http://www.kerrywong.com/2010/04/02/on-atmega328-bootloading-with-ftdi-bitbang-method/), you could load your program without having to use a bootloader. Check out the Arduino forum, there are a lot of examples there. Good luck. I want to get started with Arduino and found the following project board I’m thinking of buying or clone-ing (http://www.mantech.co.za/datasheets/products/PC14-006-01.pdf). I was wondering if you can do a similar thread to this one, but showing how to interface the FT232R with the ATMega328 instead of CP2102…? Thanx in advance and keep up the good work! Thanks for your comment. 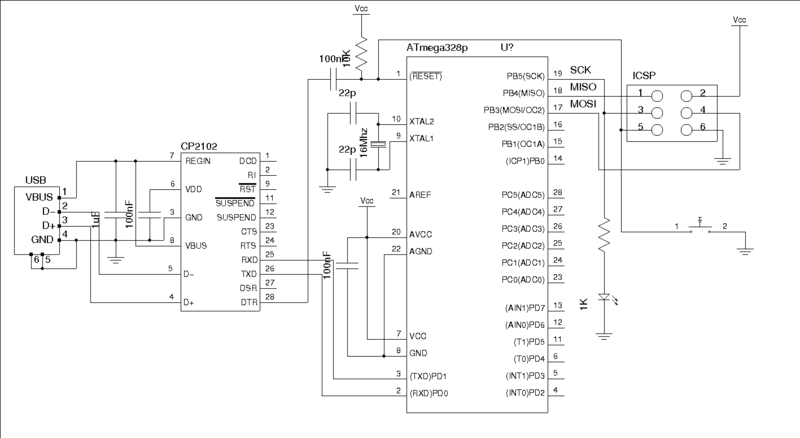 I don’t have an FT232RL chip right now, but if you take a look at the schematic for Arduino Duemilanove (http://arduino.cc/en/uploads/Main/arduino-duemilanove-schematic.pdf) you will see that the FT232RL portion of the circuit. Basically, you will need C4, C8, C10, RTS, C13 as a bare minimum. Pin 1 and Pin 5 (Rx, Tx) of FT232RL along with the reset signal (via R2, C13 to ATmega328’s reset pin) will be used to communicate with Arduino’s UART port (D0, D1). Hopefully this helps. I’m thinking of designing a minimum breakout board for the FT232RL that will plug into an ATMega328 Project Board like a small “shield” (stil have to design that part). C4 is the USB power bypassing cap, it needs to be placed as close to the USB connector as possible. C8 is the FT232RL 3V3 bypassing cap, and needs to be placed as close to pin 17 of the chip as possible. C10 and C13 are not as critical (C10 is to provide power reset timing delay and C13 is used to generate the reset signal required by the ATmega328P). Will the following board work in the mean time? (http://www.mantech.co.za/datasheets/products/PMOD-USBUART_D.pdf) …or will the 3.3V be a problem? Your page is the best source I can find regarding a CP2102. Have you tried with Xp? Do you know settings for sketch to make the CP2102 work? I have been using the CP2102 board for a while now (both with Linux and Windows) and it has been working really well. Since it is just a USB to UART converter, no special software is needed Linux. For Windows, you will need the driver from silab (http://www.silabs.com/products/mcu/Pages/USBtoUARTBridgeVCPDrivers.aspx). If you built the circuit according to what I have, then it should work (The 100nf cap to the RESET pin on the ATmega328 is essential as ATmega328 needs to be reset right before the upload begins, according to the Arduino bootloader design). The Arduino bootloader I used is the standard Duemilanove bootloader if this helps. I am using arduino Duemilanove with cp210 i.c..
in robot c its even not detecting the device..
will u please guide me if ther is any solution. CP2102 is just a USB to UART bridge, so whether or not it works with other platforms depending on whether the other platforms support UART. AVR programmers usually use the ICSP interface. I am not familiar with robot c, but if it works with an Arduino with FT232RL it should work with CP2102 as both are USB to UART converters. I was having problems with a cloned MiniPro and a Cheap CP2102. I’d done the DTR to rst pin rewire to allow auto restart. RXD to RX1(on MiniPro) i.e. not swapped like FT232RL boards. Windows 7 Silicon Labs driver was installed as part of a professional project a while back although it worked fine as a USB to TTL board I had to load the 64bit 2013 driver for it to work with the Arduino IDE. Very nice info regarding CP2102. I want to use arduino usbhost shield to grab data from a usb device with CP210x and send it via bluetooth. Will you be able to guide me to a solution regarding the same ? Hi, thx for ur amazing diagram. but i’m confused about the polarity of the capacitor for the 100nF. im using an electrolytic capacitor. But i’m confused about the polarity….thx for reply!! The 100nF capacitors are ceramic ones, no polarity. Hey, I was wondering, what is the ICSP?